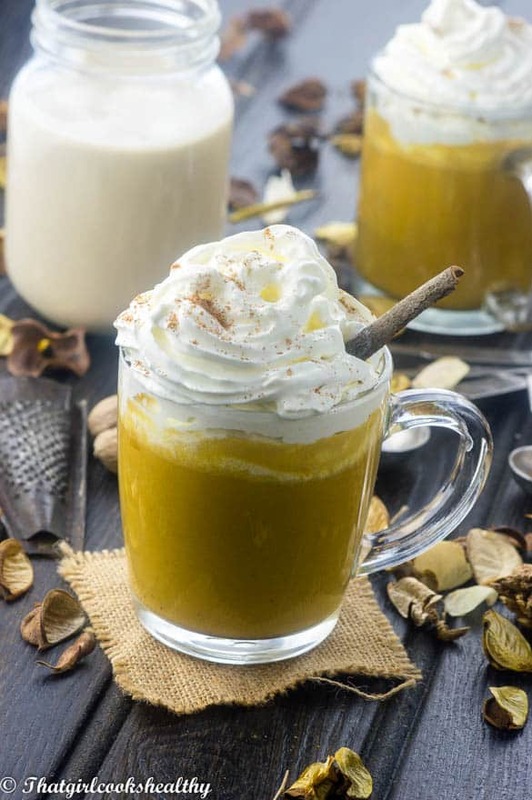 Pumpkin spice drink – Chill out in the comfort of your own home with some winter warming dairy free spice infused drink. One of the best things about winter time has to be pumpkin spice drink. Whenever I “carb up” I always consume a surplus of various squash, oats and quinoa. Don’t get me wrong I still eat my traditional Caribbean root vegetables, but I do enjoy eating the aforementioned a bit more merely because most of my supermarkets sell all of those items at a considerably low price. If you like eating pumpkin and squash throughout the calendar year, here is a tip, cut the pumpkin into cubes. place in a freezer bag and storage in the freezer. I like to buy the biggest pumpkin that I can find, chop it up and freeze so I can eat anytime at my leisure. 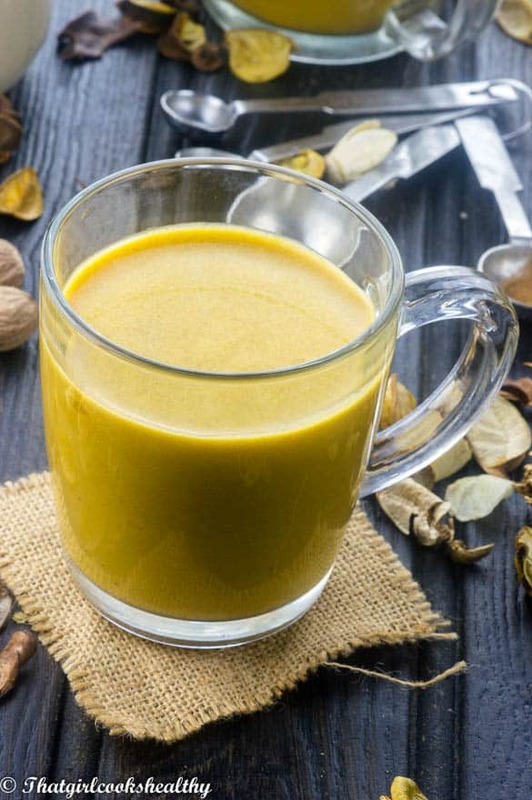 As this pumpkin spice drink recipe suggests, I am a huge lover of turning wholesome root vegetables into heart warming hot drinks. Do you remember my sweet potato pie smoothie? That velvety smooth drink went down a real treat some number of years ago. In fact I was petrified that I wouldn’t be able to live up to those standards again. 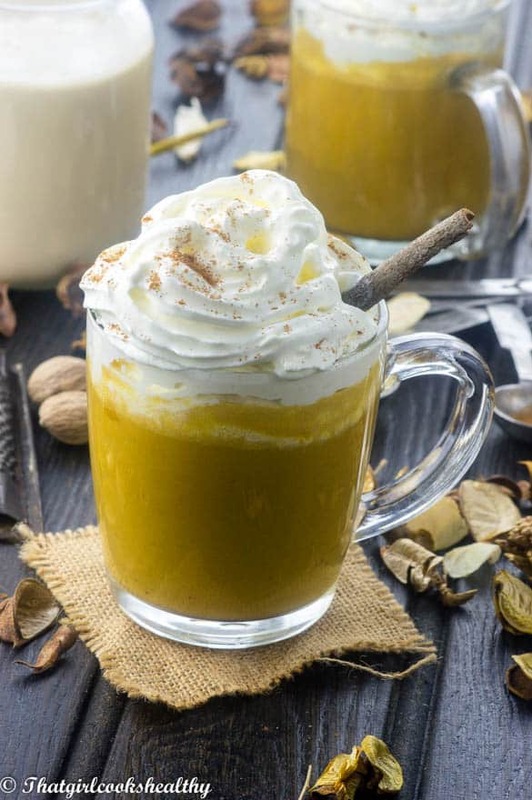 I think this spice infused drink recipe supersedes the sweet potato pie smoothie, why because it’s a hot drink, it’s that simple and nothing beats the warmth of a hot beverage on a ice cold winter day, so what if pumpkin is associated with the fall? Let me be a trendsetter by submitting a fall related vegetable in the middle of winter in January to boot. You will thank me for proving you with a vegan style drink to cosy up to your book with during the evenings. 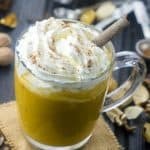 How to make pumpkin spice drink? This recipe is very simple to make and only requires a high speed blender to ensure no chunky bits are left floating at the bottom and a saucepan to heat up the actual drink. Feel free to use any type of nut milk you have to hand although I like to use almond milk as it’s the most neutral in taste. The topping is optional but to achieve these results you will need vegan style whipping cream to hand. This recipe contains no coffee, however feel free to add a splash of coffee if you wish. 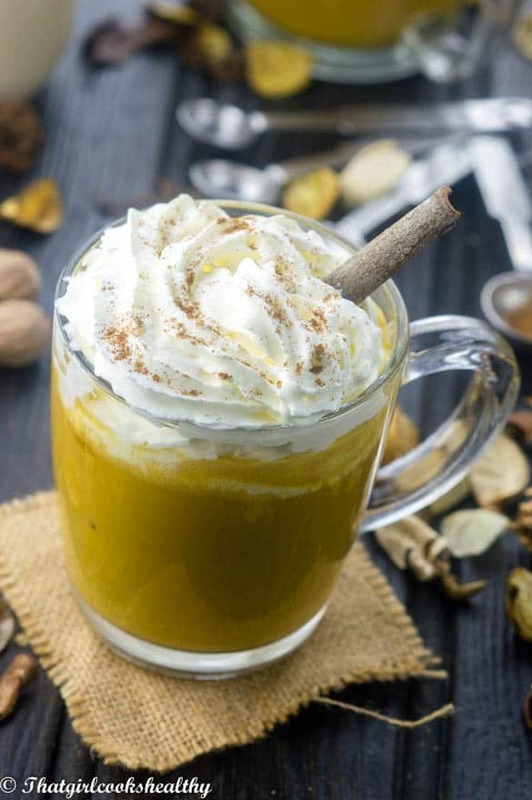 Add the pumpkin puree, almond milk, spices and vanilla to a high speed blender. Blend the ingredients into a smooth consistency. Pour the mixture into a saucepan on medium heat . Allow the pan to simmer all the while stirring continuously so the contants doesn’t burn. After a few minutes finally stir in the condensed coconut milk to your desired sweetness and serve with optional vegan cream on top. What a luscious sounding drink! I do indeed loved pumpkin and butternut squash all year — so I appreciate the freezing tip! My Mom had a huge crop of pumpkins and squash this past fall. This would be a great thing to try, getting tired of breads! I love the flavours of root vegetables and squash, so having them in a warm drink sounds wonderful. Easy to make, and enjoy; and full of goodness and warmth. Such a great idea, perfect for these bitterly cold days in January. Thanks Helen. Yes definitely a must for winter! Yay! Pumpkin Spice lives on! This looks delicious and I must try it!